j u n e / j u l y 2 0 1 5 www.resourceworld.com 11 it sold for $4.4 million. Thomas said, "We don't have a value for the latest one yet, but it could very well set a new record." I asked her with what other compa- nies was she working. She said, "Over the course of the last year or so, I have reduced my board participation down to three companies. I sit on the boards of Lucara, Kaminak and Suncor Energy [SU-TSX, NYSE]. I also act as an advisor to North Arrow Minerals. My role as CEO of Kaminak is my only executive position." North Arrow Minerals Inc. [NAR- TSXV] is in the process of completing a 1,500-tonne bulk sample at their Qilalugaq Project, 9 km north of Repulse Bay, Nunavut, Canada. The results from approximately 600 tonnes processed so far yielded close to 190 carats including eight stones greater than 1 carat in size. Almost 21% of the diamonds recovered by weight were classified as yellow, with a broad range of colors and hues includ- ing vivid canary yellow. Stones of such a vivid canary yellow are rare in Canada and indeed the world. Thomas said, "Qilalugaq caught our attention because small sam- ples collected from drill-core early on had yielded a population of vivid yellow dia- monds, which are generally rare in nature. The bulk sample in 2014 was aimed at col- lecting a much larger sample to determine whether those nice colors would continue into the larger, commercial sized diamond fractions. The results from the first half of the bulk sample confirmed just that, which is a great start. And, once we have completed processing the total sample, the diamonds will be sent to Antwerp for an independent diamond valuation. We are very pleased with our progress so far." 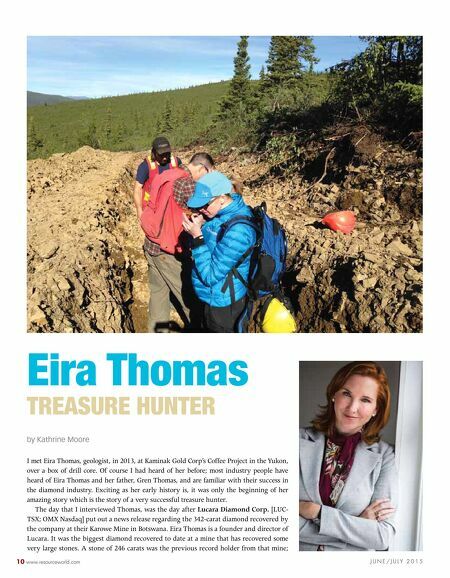 I asked Thomas what made her get involved in a gold project, and Kaminak Gold Corp. [KAM-TSXV] in particular. "I became involved in Kaminak because they were looking for someone to take over after their CEO retired in early 2013, and I was acquainted with a number of the board members, including the chair- man. The chairman, John Robins, was one of the original founders of Stornoway Diamond Corp. [SWY-TSX; SWYDF-OTC] many years ago. He approached me as he felt I had the right skill set, having been involved in a number of projects that have evolved from exploration to feasibility and ultimately into development. I have also spent most of my career working in the north, so I understand that environment. 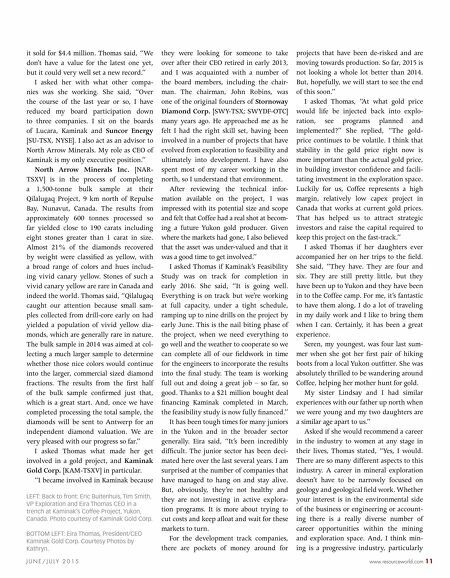 After reviewing the technical infor- mation available on the project, I was impressed with its potential size and scope and felt that Coffee had a real shot at becom- ing a future Yukon gold producer. Given where the markets had gone, I also believed that the asset was under-valued and that it was a good time to get involved." I asked Thomas if Kaminak's Feasibility Study was on track for completion in early 2016. She said, "It is going well. Everything is on track but we're working at full capacity, under a tight schedule, ramping up to nine drills on the project by early June. This is the nail biting phase of the project, when we need everything to go well and the weather to cooperate so we can complete all of our fieldwork in time for the engineers to incorporate the results into the final study. The team is working full out and doing a great job – so far, so good. Thanks to a $21 million bought deal financing Kaminak completed in March, the feasibility study is now fully financed." It has been tough times for many juniors in the Yukon and in the broader sector generally. Eira said, "It's been incredibly difficult. The junior sector has been deci- mated here over the last several years. I am surprised at the number of companies that have managed to hang on and stay alive. But, obviously, they're not healthy and they are not investing in active explora- tion programs. It is more about trying to cut costs and keep afloat and wait for these markets to turn. For the development track companies, there are pockets of money around for projects that have been de-risked and are moving towards production. So far, 2015 is not looking a whole lot better than 2014. But, hopefully, we will start to see the end of this soon." I asked Thomas, "At what gold price would life be injected back into explo- ration, see programs planned and implemented?" She replied, "The gold- price continues to be volatile. I think that stability in the gold price right now is more important than the actual gold price, in building investor confidence and facili- tating investment in the exploration space. Luckily for us, Coffee represents a high margin, relatively low capex project in Canada that works at current gold prices. That has helped us to attract strategic investors and raise the capital required to keep this project on the fast-track." I asked Thomas if her daughters ever accompanied her on her trips to the field. She said, "They have. They are four and six. They are still pretty little, but they have been up to Yukon and they have been in to the Coffee camp. For me, it's fantastic to have them along, I do a lot of traveling in my daily work and I like to bring them when I can. Certainly, it has been a great experience. Seren, my youngest, was four last sum- mer when she got her first pair of hiking boots from a local Yukon outfitter. She was absolutely thrilled to be wandering around Coffee, helping her mother hunt for gold. My sister Lindsay and I had similar experiences with our father up north when we were young and my two daughters are a similar age apart to us." Asked if she would recommend a career in the industry to women at any stage in their lives, Thomas stated, "Yes, I would. There are so many different aspects to this industry. A career in mineral exploration doesn't have to be narrowly focused on geology and geological field work. Whether your interest is in the environmental side of the business or engineering or account- ing there is a really diverse number of career opportunities within the mining and exploration space. And, I think min- ing is a progressive industry, particularly LEFT: Back to front: Eric Buitenhuis, Tim Smith, VP Exploration and Eira Thomas CEo in a trench at Kaminak's Coffee Project, Yukon, Canada. Photo courtesy of Kaminak Gold Corp. BoTToM LEFT: Eira Thomas, President/CEo Kaminak Gold Corp. Courtesy Photos by Kathryn.